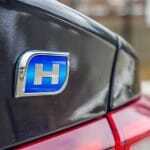 Out on the road it’s really easy to forget that you’re behind the wheel of a hybrid vehicle. 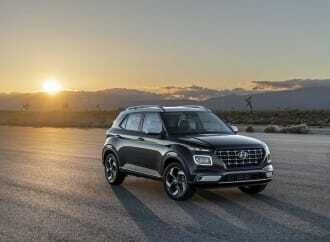 The market may be shifting away from sedans in general, but that doesn’t mean that manufacturers haven’t been quietly designing some really good cars. 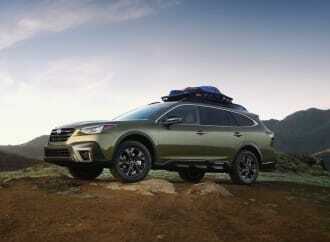 Plus, even with all the crossovers and SUVs on the roads, sedans still play a prominent role, and there is a more traditional buyer base that prefers and appreciates sedans. Four doors, a real trunk, low step in height, easy maneuverability, sharp handling and thrifty fuel efficiency all comes together for a winning formula that will always have some place in the automotive marketplace, even if it’s not the dominant force that it once was. 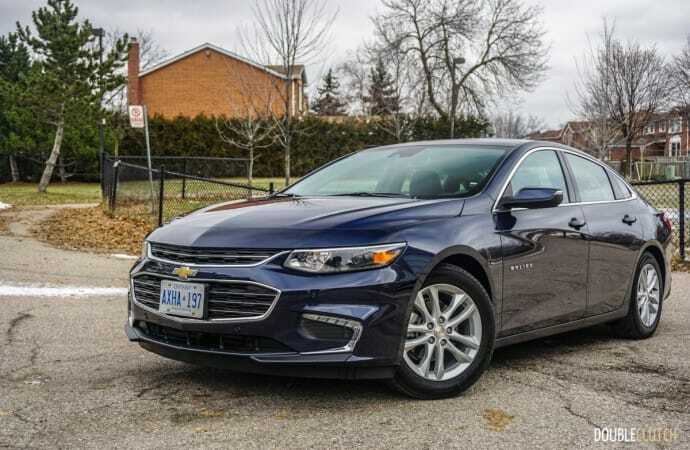 The traditional sedan has come a long way, and one of the better examples of this progress is the Chevrolet Malibu; a traditional sedan with deep roots in GM’s history, a nameplate that has ridden the ups and downs and continued to evolve into the modern car that it is today. 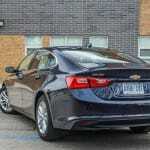 A long way from V8s and velour seats, on test is a 2017 Chevrolet Malibu Hybrid, which delivers some serious competition to the likes of the Honda Accord (reviewed here), Toyota Camry, and other midsize sedans that are available in hybrid form. 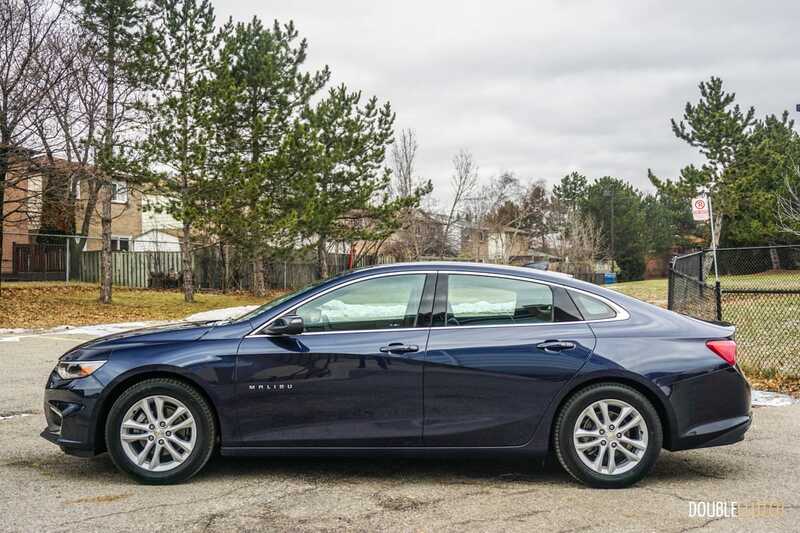 Firstly, the 2017 Malibu’s styling carries on unchanged from the 2016 model (reviewed here), an all-new design. 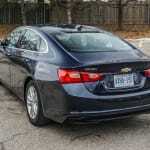 I still think it’s a sharp looking sedan, and it wears the corporate GM fascia better than most of the current crop. 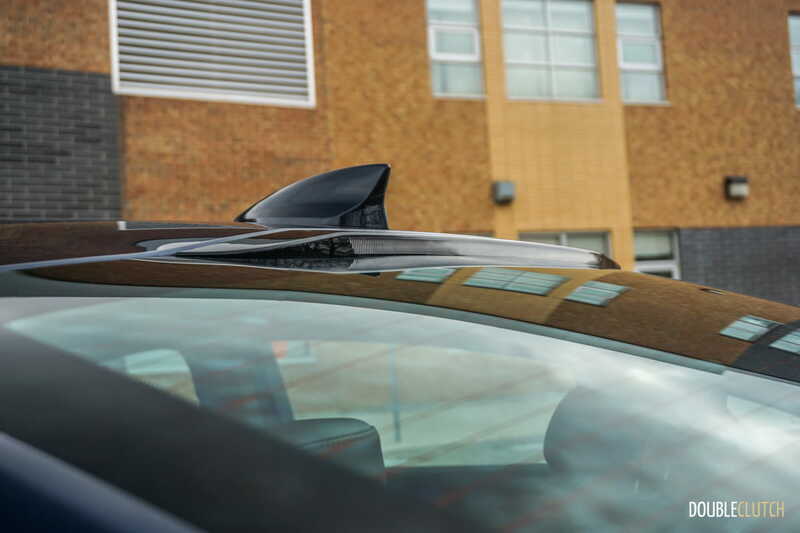 The sculpted sides add a bit of drama to the Malibu’s looks, and the sleek roofline flows into the rear window and right down to the end of the trunk lid. 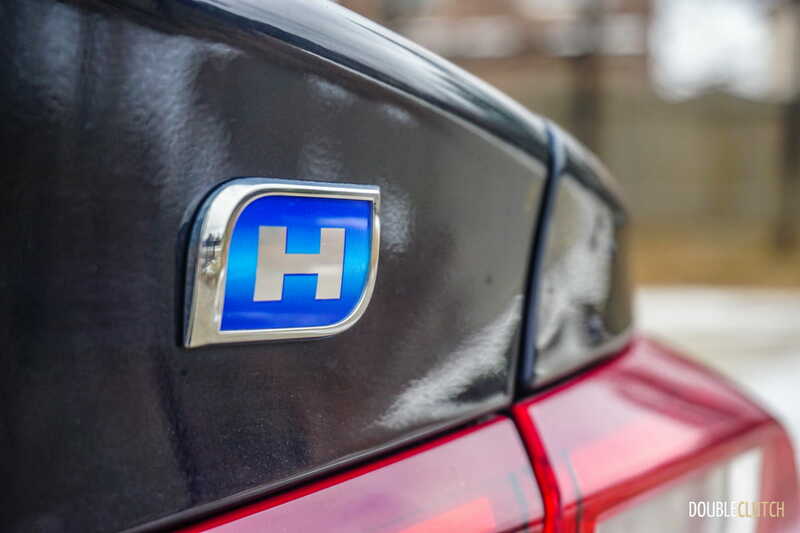 The rear end is actually one of my favorite current sedan designs, from a strictly aesthetic point of view, sort of a toned down version of the Audi A7. 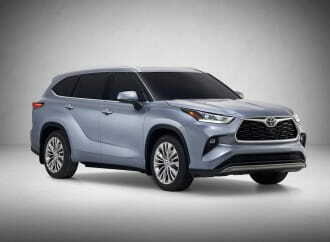 Up front, LED daytime running lamps are now available, which does add a trendy touch, but the awkward boomerang shape doesn’t really flow well with the rest of the sleek aerodynamic looks. My test car came in Velvet Blue Metallic, a good looking color, even though I am not typically a fan of blue cars. 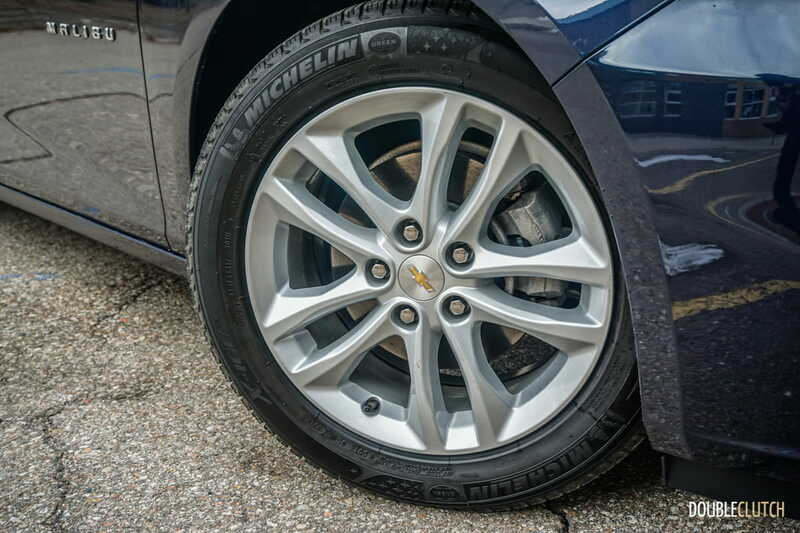 It also wears a set of stylish 17” alloy wheels, which looked appropriate, and it was refreshing to see Chevrolet not jumping on the massive rim bandwagon here. The interior flows equally well, with lots of sculpted lines and organic shapes, often accented in tasteful amounts of chrome trim. There are also some glossy grey plastic accents that sort of resemble carbon fiber, which feels a little out of place, I would rather it just have been black. 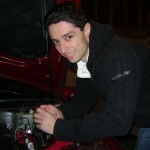 That said, the interior feels well put together, with no obvious panel fitment issues, squeaks, creaks or rattles. 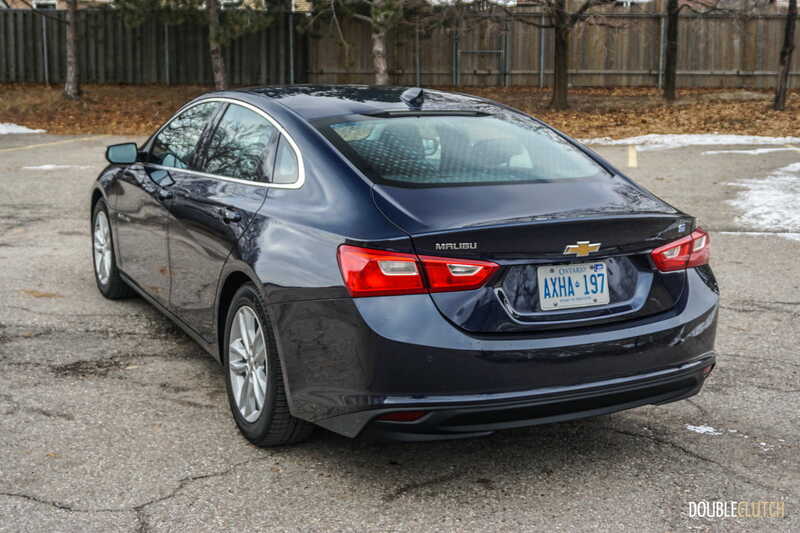 The low roofline, while stylish, does make the Malibu feel a little bit cave-like, and cuts into driver visibility. I easily got used to it, but the first few minutes behind the wheel felt a little strange with the roofline being a lot lower than I am used to. 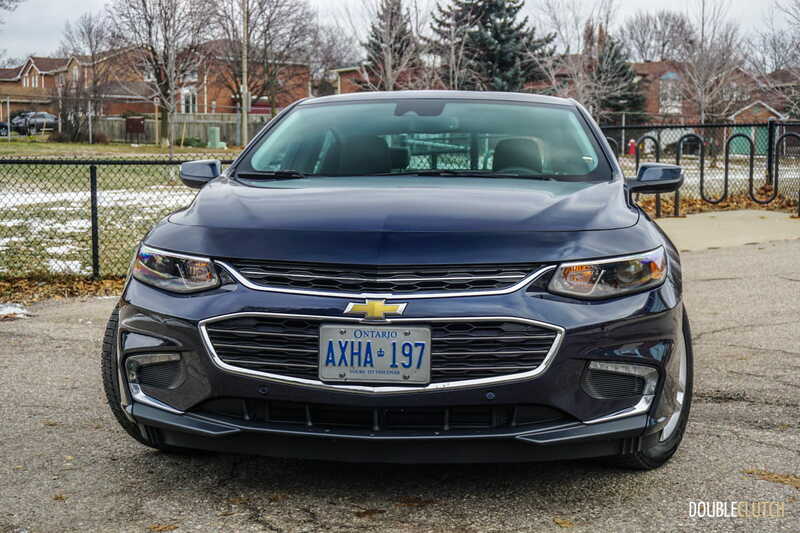 Despite the roofline, there is a surprising amount of room inside the Malibu; it’s actually amazing at how little of an impact the hybrid batteries on board make to the amount of usable space. 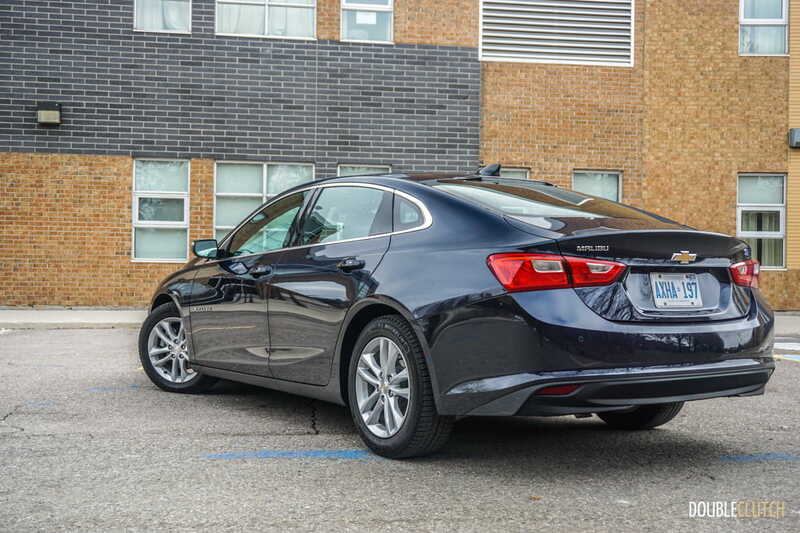 Rear legroom is generous, the trunk is one of the largest I’ve seen in any hybrid sedan, and there is plenty of organized storage up front in the well-designed center console and door pockets. 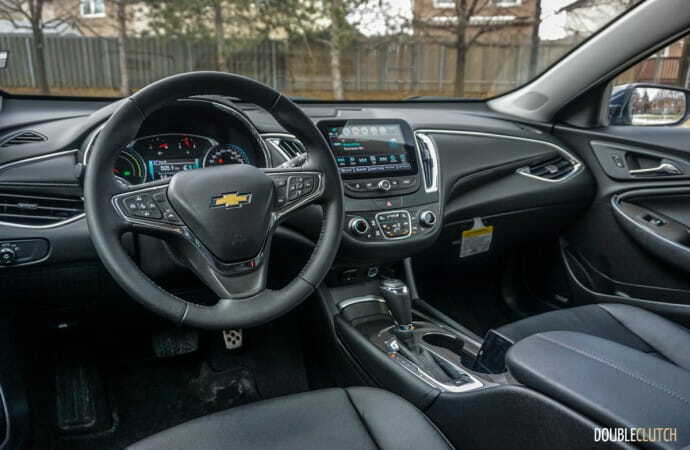 Despite the amount of technology in the Malibu, interior controls are all fairly simple and straightforward for anyone to use. 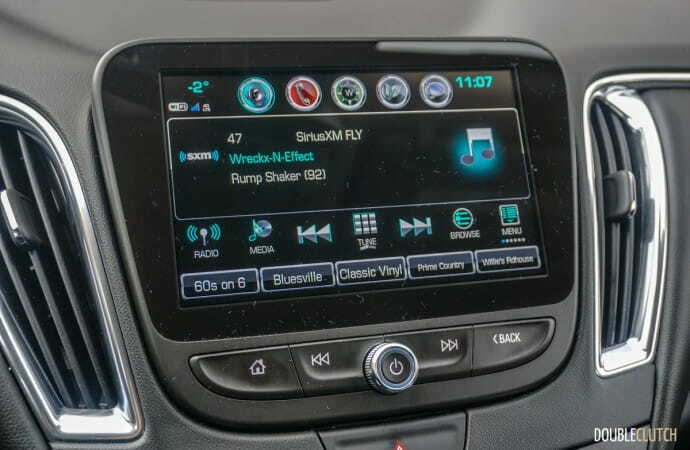 This includes the overall layout, which gives the driver good access to every important feature without reaching or taking one’s eyes off the road. 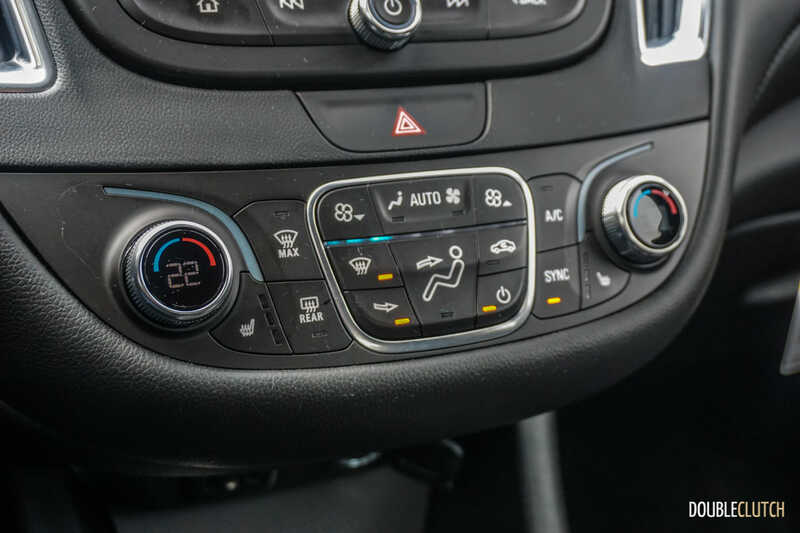 GM has improved the automatic climate control system to give the user more control while keeping the system in “auto” mode. For example, fan speed and direction can be controlled separately, and you’re able to manually override one, while keeping the other in ‘auto’. 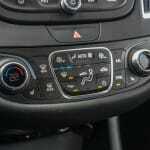 It seems simple, but in many cars it’s eihter all automatic, or all manual control. 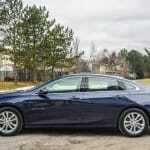 The Malibu Hybrid starts at a very reasonable $28,850 for a base model car. This still gets you enough of the basic features you’d want like a 7” touch screen, 4G-LTE WiFi hotspot, cloth buckets and more. 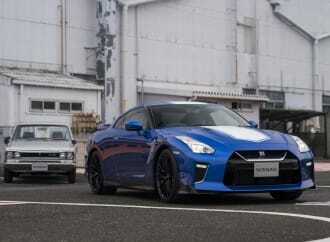 There are only two option packages to add, which pushed the as-tested price of the test car to $34,780. The first is a Convenience and Technology Package which gives you a remote starter, the color driver information LCD screen in the gauge cluster, a bigger 8” touchscreen, leather-wrapped wheel and shifter, wireless charging station and the full driving aid package. 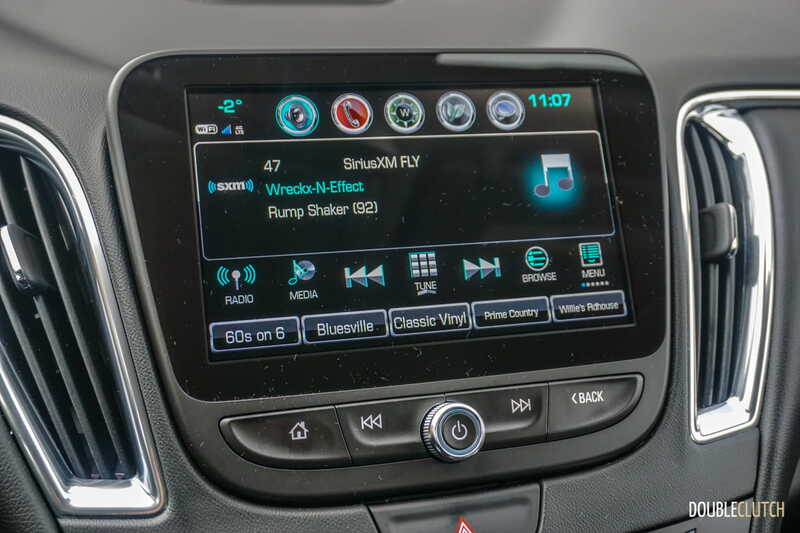 The other package is called the Leather and Convenience package, and it actually includes all the above, plus heated leather seats, Bose nine-speaker surround sound, and a few other gadgets. 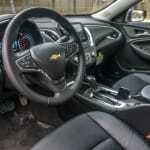 Notably, there is no sunroof or heated steering wheel available on the Hybrid. 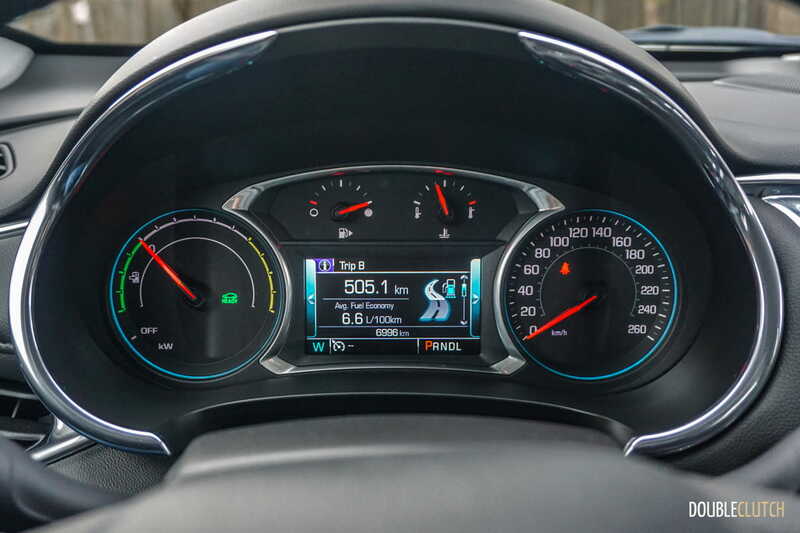 Like most modern hybrids today, on the road it’s really easy to forget that you’re behind the wheel of a hybrid vehicle. 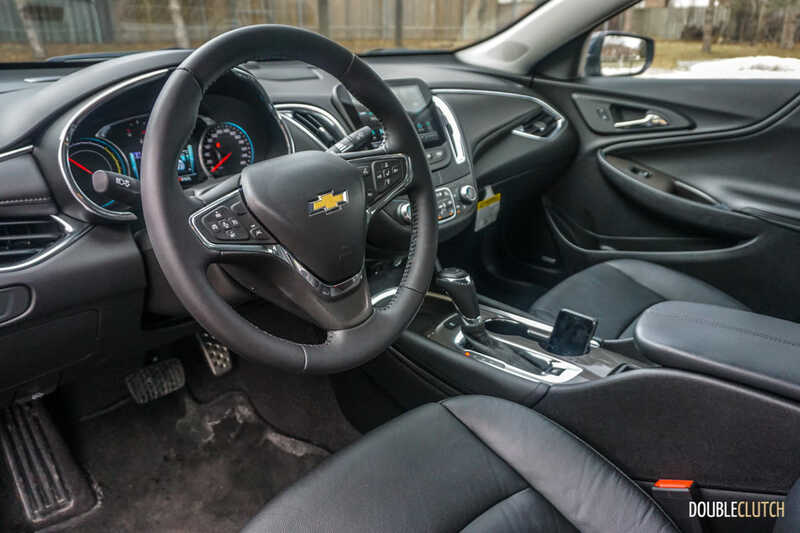 The Malibu is smooth, quiet and delivers rather sharp and peppy throttle response thanks to its 1.8L inline four-cylinder and twin motor electric drive unit. 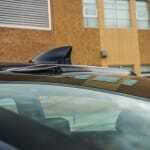 The combination puts out 182 horsepower and a healthy 277 lb-ft. of torque, which feels plenty adequate in the Malibu. Handling is competent, although a soft suspension and the extra weight of the hybrid batteries mean that the car does lean considerably during hard cornering. 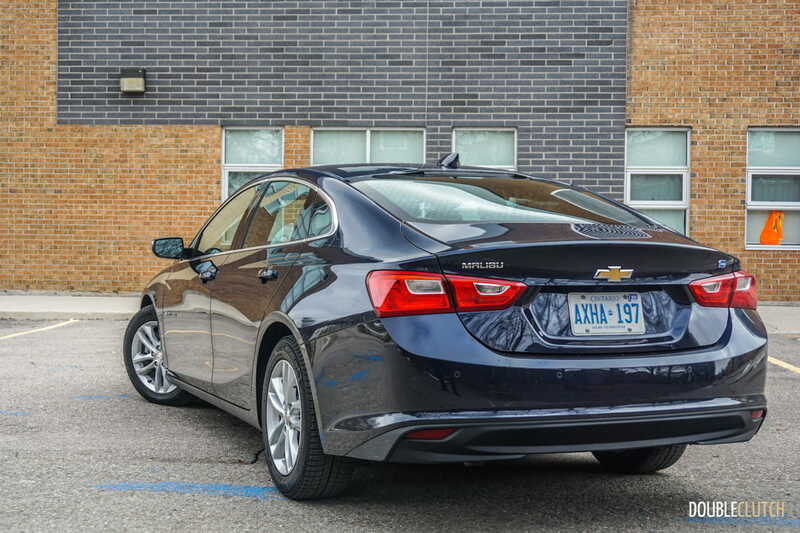 This suspension also means that the Malibu has a very soft ride and makes for an excellent relaxed highway cruiser. 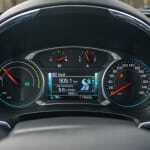 Steering feel is tight and confident, not sporty, but it gives a nice sense of control. 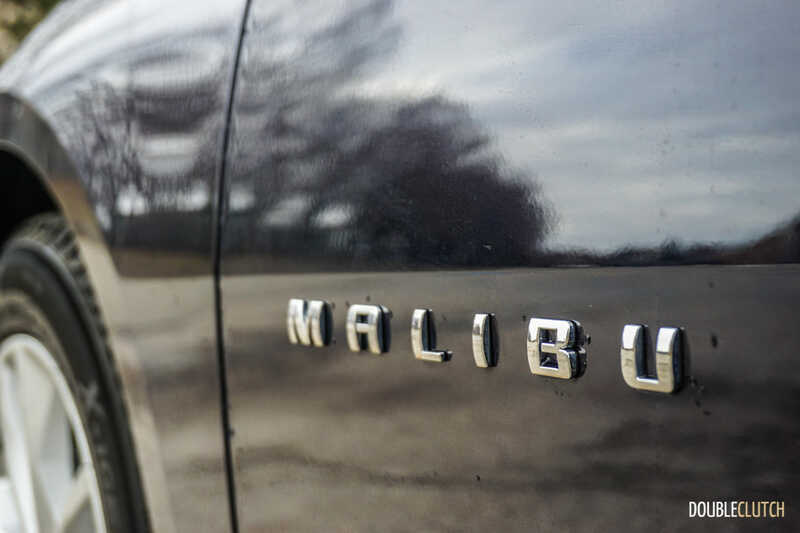 My week with the Malibu turned out to be a very hectic one, and I was glad to have it. 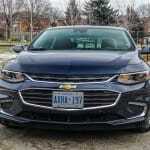 Lots of city driving in heavy traffic, plus an early morning ice storm, and the Malibu handled it all like a champ while keeping me comfortable, relaxed and saving fuel. Speaking of saving fuel, my average was a satisfying 5.7L/100kms during my week with the car. 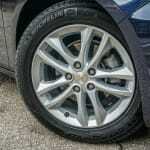 That’s in the middle of January, making use of the remote start system, and riding on winter tires, so conditions were not ideal in the slightest.. Like most hybrids available, there is a ‘driving coach’ feature, which is basically an efficiency gauge to help you adjust your driving for maximum efficiency. It’s not exactly easy to find though, and it’s a bit distracting overall, but it’s still a cool gimmick. Even as a muscle car and truck guy, I enjoyed driving the 2017 Chevrolet Malibu Hybrid. 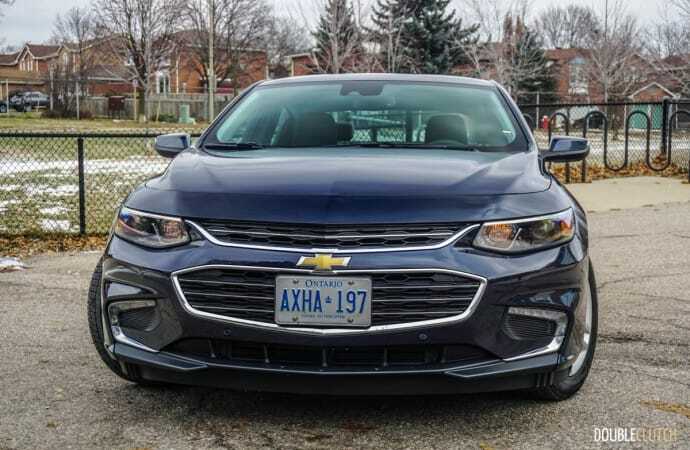 This is a car that only reinforces that front-wheel drive and a good set of winter tires is more than enough to get around Toronto in January. 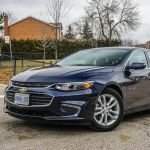 What’s even more remarkable about the Malibu was filling it up – after almost 800km of tough driving, all it took was $43.00 of regular-grade fuel, and it’s ready to go for another week of commuting. 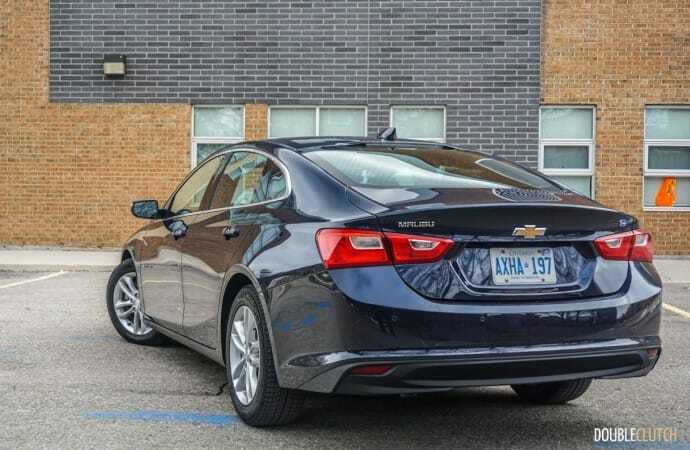 There are a lot of cars you can buy for $35,000, but few of them offer the amount of space, refinement and technology that the Malibu does, and all in an attractive package. 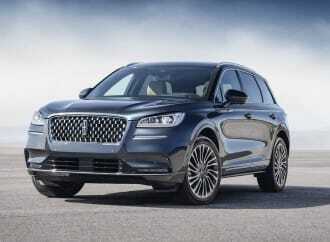 GM has done well with this one, and it’s a very worthy rival to the well-established midsize hybrids out there.